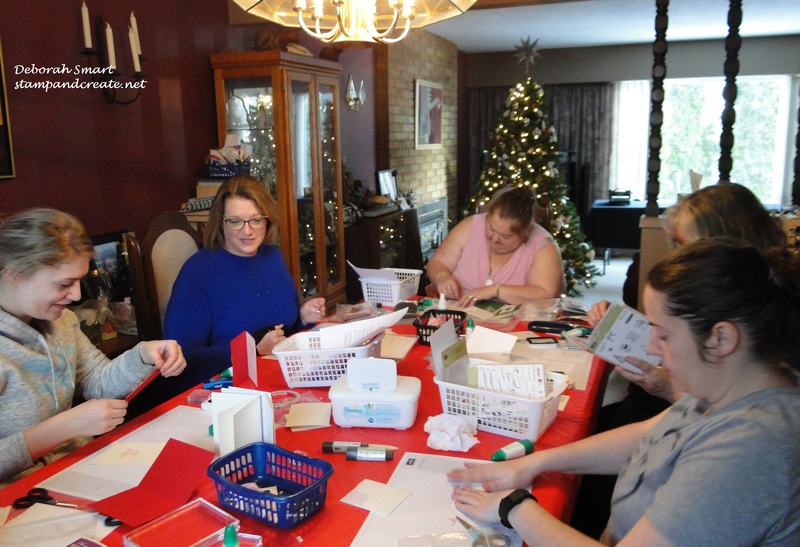 Thanks to the wonderful ladies who came out this past Saturday: Susan, Amanda, Evangaline, Pam, Angela and Jane – especially since we had to postpone the get together from the previous Saturday, due to the weather and road conditions! It’s been quite snowy here the past 2 weeks, and the temperatures have been unusually cold, which kept the snow on the ground, instead of melting away within a day or two, as usual for Vancouver. 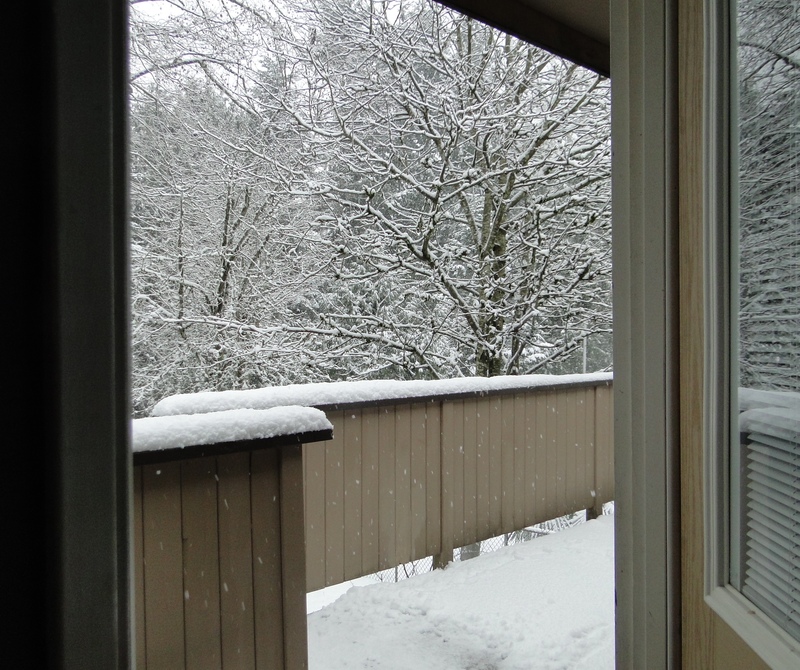 This was a quick peek out my back door, looking onto the deck. It sure was cold! From the response, everyone loved the variety of cards; it was interesting how everyone had their favourite! I have more photos; if you’d like to see them, I’ve posted them on my business Facebook page – you can check it out and ‘like’ my page by CLICKING HERE (www.facebook.com/stampandcreate). That will take you directly to my page; if you ‘Like’ my page, you’ll receive updates whenever I post something new! I’ll share some details of each card over the week; we’ll start with this one here, that I ‘CASE’d from my team member, Lynn! (CASE stands for Copy And Share Everything – it’s when you copy the basic idea or layout of a card, and add/change something to make it your own). I started with a card base of Real Red cardstock. On a panel of Very Vanilla cardstock, I stamped the sentiment from the Tin of Tags stamp set in Real Red ink. 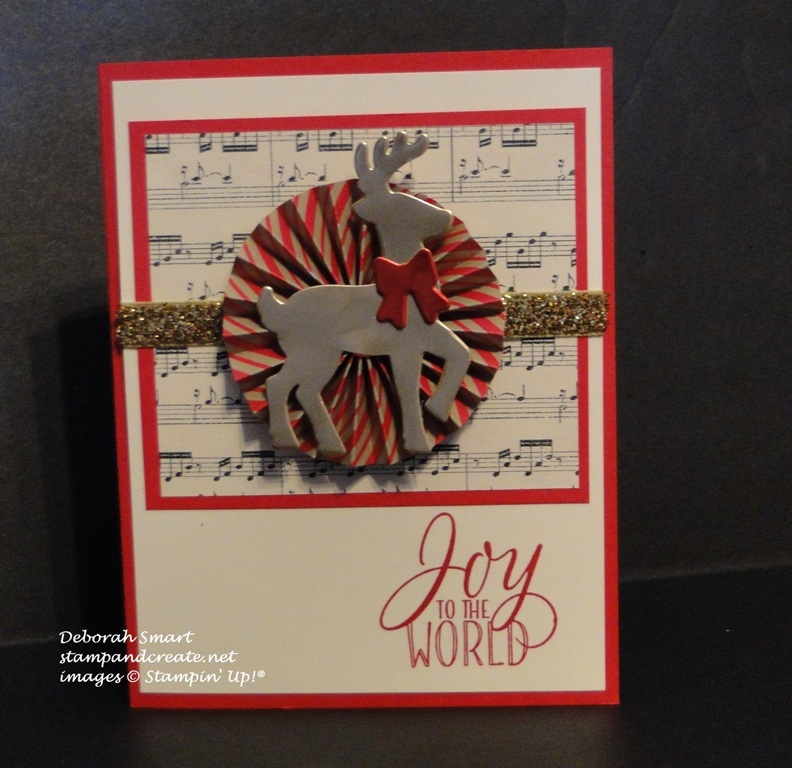 On a smaller panel of Real Red cardstock,I added a piece of the music sheet patterned paper from the This is Christmas Specialty Designer Series Paper (in the annual catalogue – page 172). Over that, I wrapped some of the retired Glitter Gold Ribbon across the middle. In the middle of that panel, I attached a medallion I had made using red & gold striped patterned paper from the Candy Cane Lane DSP. On top of that, I added the die cut reindeer, and his little die cut bow! I think this can be considered a ‘wow’ card, because of the medallion, but it actually comes together quite quickly! 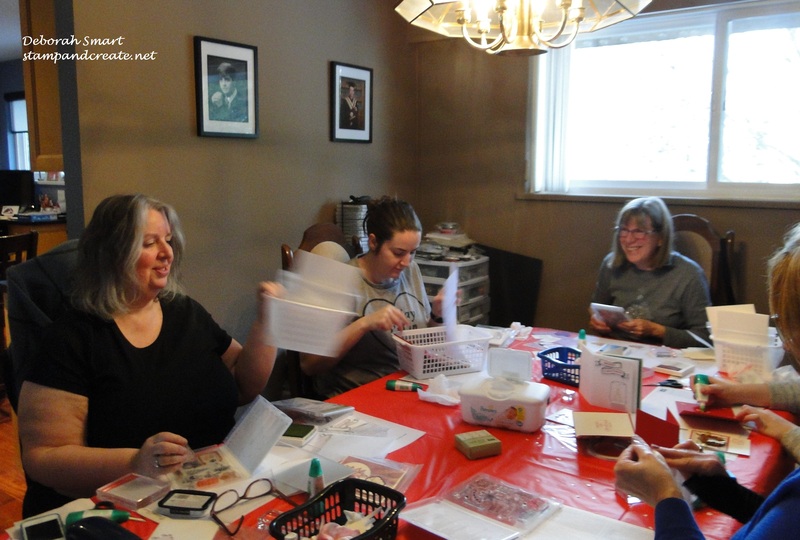 The adhesives I used were the liquid Multipurpose Glue (cardstock layering), Tear & Tape (ribbon) and Stampin’ Dimensionals (reindeer). I’d love to hear what you think about the cards we made – just leave me a comment! And be sure to come back tomorrow, for details on more of the cards. If you’d like to purchase the supplies used in making this card, just click on the image(s) below, and you’ll be taken directly to my online store. And remember – the Year End Closeout Sale is still going strong – there’s lots of time to shop & save! Hi Deb! What a fun class! Your guests look like they’re having a blast! Lovely cards and a great variety! What is a Nanaimo bar? !